"I resolved on my birth. I decided who should be my mother." Thus answered Swami to a question from the editor of the "Nav Kaal" (New Age) on the last day of December 1970 in Bombay, India. Baba went on to say that Rama and Krishna also chose their mothers. Easwaramma a poor, middle-aged tender-hearted, pious illiterate rural housewife had mothered seven children before the Lord was born to her. Easwaramma was quite conversant with Telugu ballads, legends, folk songs and tales, on Rama and Krishna. Yet, it took years of intimate observation and hundreds of inexplicable incidents to convince her that this child who was born in answer to her prayers to Lord Sathyanarayana, who she had fondled and doted on, was the Cosmic Consciousness. Baba has said that there are four types of children born in this world. The law of Karma operates on the birth of three of these four types. The fourth and foremost is one who is an Avatar. Here the Cosmic Consciousness decides on a human role and chooses the time and place of birth and the persons who are to be the parents. In the Treta Yuga (age) Vishnu having elected to be born as Rama, chose King Dasaratha and Queen Kowshalya as his parents. The Avatar bestows glory on those chosen as parents. Sri Krishna, the first of the Poorna Avatars (Total Advents) is the clearest example of the immaculate conception of a Divine child. The incarnation of Buddha too was marvelous. The night He determined to enter the world, Queen Maya, the consort of King Suddhodana, dreamt that a splendid star from the Heavens having shot through outer space entered her womb from the right. Mary the mother of Jesus was similarly blessed. The angel Gabriel was sent by God to the Virgin espoused to Joseph of the House of David. And the angel said to her "Fear not Mary. Thou hast found favour with God. And behold thou shalt conceive in the womb and bring forth a son and shall call him Jesus." The chosen mother is the first recipient of the Avatar's Grace. The father who protects and nourishes her is rewarded with the fame bestowed on his name. When Swami's father Pedda Venkappa Raju died in 1963 Baba said "on the day he was known as the 'Father' he was blessed and his life rendered holy and sanctified. This good fortune can be won by only one individual in a Yuga (age)." More than hundred miles from Puttaparthi is the village of Kolimikuntla. In this village lived Subba Raju an ardent devotee of Easwara. Subba Raju built a temple for Easwara. in that village. Easwaramma was the name given to his daughter born in the farm house soon after. the temple was built. Kondama Raju -(Bhagavan's paternal grandfather) decided to go on a pilgrimage and at the same time visit his distant relative Subba Raju. He took his elder son Pedda Venkappa Raju along with him. On arriving at Subba Ragu's place Kondama Raju found that place arid, unsuitable for cultivation and surrounded by dacoits. He persuaded Subba Raju to sell his lands in Kolimikuntla and move to Karnatanagapalli opposite to Puttaparthi, on the other bank of Chitravathi. To sweeten the pot, Kondama Raju offered to welcome Easwaramma as the spouse of his son Pedda Venkappa Raju. 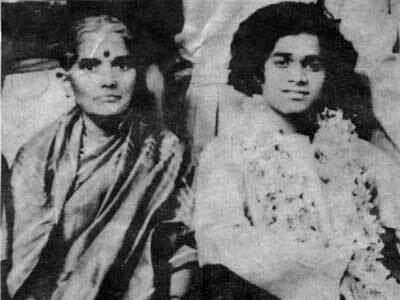 Easwaramma was barely fourteen when she wedded Pedda Venkappa Raju. Seshama Raju, Swami's elder brother, was born to Easwaramma within three years of her marriage. A few years later Venkamma a daughter arrived. 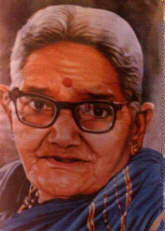 Another daughter Parvatamma followed. The Rajus were happy and their home was filled with the youngster's babble and laughter and song and prayer. But, sorrow was not far off. Easwaramma had four abortive pregnancies in a series. Some attributed this calamity to black magic. Propitiatory pujas (worships) were arranged in the local temples and distant holy places like Kadri. And when Easwaramma entered her eighth pregnancy her mother-in-law Lakshmamma offered a series of pujas to Lord Sathyanarayana and prayed to be blessed with a grand-son. Bhagavan was once asked by a pundit "Swami, was your incarnation a Pravesa (entrance) or Prasava (enceince)." Turning to Easwaramma Bhagavan said "Tell Rama Sarma what happened that day near the well." Easwaramma replied "my mother-in-law had cautioned me that I should not be frightened if something happened through the will of God. The morning when I was at the well drawing water a big ball of blue light came rolling towards me and I fainted and fell. I felt the light glide into me." Swami turned to Rama Sarma with a smile and said "there you have the answer. It was Pravesa and not Prasava." It took Easwaramma a long time to reconcile herself to her son's Avataric traits. Whenever she was around, she personally supervised the preparation of his food. She believed that Swami would eat a few more morsels if the cuisine was Andhra and that too genuine Rayalaseema, the region to which Puttaparthi belonged. She would witness Swami's miracles in the company of others; but her response was anxiety rather than awe. She feared that the miracles would drain her son's spiritual powers. Easwaramma saw doctors and lawyers, monks and merchants, Rajas and Princes come to Puttaparthi, sit around Swami and plead for answers and solutions to their doubts and questions. She herself understood only conversational Telugu. She gasped when Swami gave them His assurance and said "Don't worry. I am with you." Easwaramma thought He was promising too much to too many. Arnold Schulman the author of the book 'Baba' visited Puttaparthi in 1970. He found Easwaramma complaining to no one in particular. She was saying "why don't they leave Him alone? He does not sleep, He does not eat enough. All they care is about themselves." On another occasion Easwaramma referring to Baba's Announcement in October 1940 at Uravakonda, said "when I stood before him face to face He said, "Maya! You are not bound to me nor I to you and He left home to be with those to whom he felt bound." 'Now many days I lived through without eating or sleeping crying to the Gods to restore my son to me. You call him Beauty, Tenderness and Joy and talk of me as the 'Mother' but, do I ever get the chance to feed him with food cooked by my own hands, give him a bath or tend to him in any way that is a mother's privilege?" The oncoming of this overwhelming despair and even jealousy was however often followed by a surge of self-criticism and matured philosophical resignation. Easwaramma appreciated the earnestness and enthusiasm of young children acquiring education. She prevailed on Swami to send money for tuition fees, cost of books and boarding to many youngsters. When she found that some youngster dropped out of school, she pressed Prof. Kasturi to correspond with the parents and persuade them to get the youngster back in school. And the sick? Easwaramma was perhaps the person most pleased when Bhagavan announced that a twelve bed hospital would be built on the hill south of Prasanthi Nilayam. However she queried the wisdom of the choice of the site. "How could the ill pull themselves up to that height?" she asked. And when women were admitted as inpatients she climbed the hill to the hospital several times to be with them. She was humble by nature. Humility was no pose for her. Hers was not the humility that paraded itself, to draw the attention of others. Many are proud that they are not proud. But, Easwaramma was allergic to limelight. Once, while Swami stayed at the residence of Dr. B. Ramakrishna Rao, the Governor of Kerala, she refused a special invitation to stay at the Governor's residence with a chosen few. She wiggled out of the attention given to her as the Avatar's mother and stayed at the humble residence of a school Head master. At the time Easwaramma laid down her mortal coils there were more than a thousand college students assembled at Brindavan for a summer course. A lecture was on and 800 youngsters were listening eagerly. Three cars purred by the side entrance to Brindavan. In one of them lay the body of the holy 'Mother', serene and self-satisfied. Daughters and grand children sat close and around as they had done for years. In the other two cars were persons selected by Swami to break the news at Puttaparthi and keep the villagers to pay their last respects. Later the body was reverentially laid down in a grave beside that of the 'Father' Pedda Venkappa Raju. The date was May 6,1972. Easwaramma Day is celebrated on the May 6th as the culmination of a week- long festival of children all over the world. The Easwaramma High School at Puttaparthi stands as a monument for the Mother's abiding affection towards children and her desire to help them unfold their talents, skills and divinity. From The Book "Easwaramma, The Chosen Mother" by Prof. N. Kasturi. Condensed.